Roberto Tijerina was eight years old when he was first asked by his aunts and uncles to accompany them to doctors’ visits as their interpreter. The first in his family to be born in the United States and speak both English and Spanish, Tijerina was soon brought to meetings at the bank to help the family pay their bills and to the Department of Human Services to help them negotiate their welfare checks. In immigrant communities across America, the responsibility of interpretation frequently falls on whoever’s close by: a bilingual family member, friend, or neighbor. The burden placed on these default interpreters—most often children— is great. Tijerina remembers making difficult decisions as a child about what information to translate and what to withhold, such as whether he should relay a racist comment made by a lawyer about his family or translate a comment by a family member that may have revealed information best kept private. 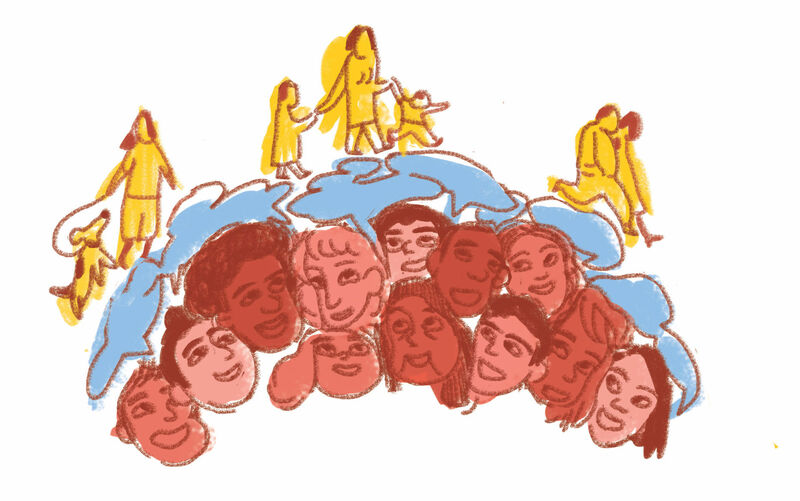 As the immigrants’ rights movement has gained traction over the past ten years, organizations and activists across the country have rallied around the project of multilingual justice, seeking to shift the burden of interpretation onto trained interpreters. The interpreters’ responsibilities in mediating between a speaker and an audience—rephrasing a speaker’s words, determining who gets to speak when, and at times, dictating the conversation’s trajectory—requires training and self-awareness. A speaker at the Highlander Education and Research Center’s 75th anniversary celebration in 2007 began his speech by declaring: “The Revolution will not be just in English.” His words have reverberated through the organization and across social activist networks. Highlander, a social justice leadership training school and cultural center based in New Market, Tennessee, has been a pioneer in the multilingual justice movement, emphasizing language access within social justice spaces as the crucial first step towards language equality in the US. With the influx of immigrants to the South—an almost 400 percent increase after the passage of the North American Free Trade Agreement (NAFTA)—Highlander seeks to provide a space for activism in which Spanish-speakers can have a voice in their communities. In 2006, Tijerina developed Highlander’s multilingual justice program and principles into a workshop curriculum designed to help people who are already working as interpreters in their communities build their interpreting skillset and better understand the political dynamics and structures embedded in their work. Since then, Tijerina has held over 150 workshops across the country, as well as scores of presentations and mini-workshops at conferences. Tijerina has presented the workshop to participants of varying ages, races, and genders—from farmers in the rural south to LGBT activists in NYC. The long-term goal of the curriculum is to expand multilingual capacity within social justice spaces—to create a norm of language access. Tijerina says that many organizations—even immigrants’ rights organizations—don’t have the infrastructure to bring in all of the people they claim to serve and facilitate dialogue between them. “A lot of organizations understand the principle of language justice and how it relates to democracy and autonomy,” says Tijerina. “But the actual practice lags far behind.” For many organizations, this gap between ideals and practice is a result of financial restrictions: the microphones, receivers, and transmitters necessary to provide simultaneous interpretation cost thousands of dollars. But, as Tijerina says, a budget is a political document: it reflects an organization’s priorities. At the office of the Olneyville Neighborhood Association (ONA), posters, flyers, and articles hang on the walls in equal proportions of English and Spanish. Enough is enough. Conoce tus derechos. No human being is illegal. Ningún ser humano es ilegal. The message is clear: this space is for everyone. Beginning informally in the 1990s in the basement of a local church, ONA now makes its home in the 150-year-old Atlantic Mills Building, a crumbling complex of mostly retail and manufacturing offices. ONA tackles issues affecting the communities of immigrants and people of color who inhabit the marginalized neighborhood, from housing and rent prices to police violence and immigration law. A bilingual but predominantly Spanish-speaking organization operating in a majority-Hispanic neighborhood, ONA has rallied around the multilingual justice movement, seeking to bridge the linguistic boundaries in Olneyville and Providence as a whole. At ONA, multilingual justice takes many forms. At its organizing meetings, ONA strives to provide interpretation and translation whenever financially and logistically possible. The group holds occasional interpreting workshops based on Tijerina’s workshop to strengthen the interpreting skills of community members. The organization also holds weekly Spanish classes for mostly white and primary English-speaking college students or recent grads trying to get involved in the group’s organizing efforts. Adan Sales, a Guatemalan immigrant who worked as a Spanish teacher at ONA in 2012, says that these classes are crucial for building trust because they break down the linguistic hierarchies and boundaries in the community. After years of interpreting for his friends and coworkers at local restaurants, Sales participated in an interpreting workshop at ONA. Sales says that these workshops are equally important for building community: when people know that there are trained interpreters in the neighborhood, they feel more confident in their daily interactions with their neighbors and coworkers, as well as with the police and elected officials. ONA has worked to implement language access not only through its internal organizing but through its negotiations with state and local legislators and law enforcement agencies. In 2011, as the newly sworn in attorney general, Peter Kilmarten signed Rhode Island onto the Secure Communities program, which required local law enforcement to forward fingerprints of all non-citizens to immigration enforcement, who would then investigate them for deportation. In response to the enactment of the program, ONA and other social activist groups held an accountability session with Kilmarten—conducted primarily in Spanish. “The goal in any accountability session is that the community holds the power in the room,” Will Lambek, a board member at ONA, told the Independent. “We want our target to feel that their back is against the wall.” Much of this power dynamic, as both Tijerina and Lambek described it to me, is determined by spatial factors: how the target, participants, and interpreters are positioned in the room. In this session, Kilmarten was seated in the corner of the stage, “tethered” to an interpreter and relying on Lambek to translate the proceedings of the room in real-time. The set-up ensured that Kilmarten would remain seated, that people asking questions stood in the center of the room, and that the dominant language in the space remained Spanish. “That’s how a non-linguistically dominant community can hold power in a space with an elected official,” explains Lambek. This is what multilingual justice looks like in an ideal scenario. But language access is rarely so seamless. ONA’s multilingual capacity relies greatly on the willingness of others to cooperate—which they often don’t. Many of the accountability sessions and community forums where ONA does their primary advocacy are held in English, with local officials often refusing to use translation equipment. Non-English speakers are frequently the ones relying on interpreters and using interpretation equipment. These unbalanced environments often discourage non-English speakers from sharing their opinions. Mirjaam Parada, a 58-year-old employee at the Omni Hotel, now active in the Unite Here! Local 217 hotel and food service workers’ union said in a phone interview she was afraid to get involved in the union’s work when she first moved to Providence from Venezuela 16 years ago because she was worried her broken English would prevent people from taking her opinions seriously. Organizers in Providence look to Boston as a model in the multilingual justice movement. The Boston Interpreters Collective was founded by a group of Boston activists after attending one of Tijerina’s workshops in 2008. The group holds monthly interpretation practice session and popular education workshops about multilingual capacity building. With an ever-growing network of over 500 interpreters in the Boston area, anyone planning a social justice-related event or meeting can easily find a trained interpreter using the group’s listserv. SOPHIE KASAKOVE B’17 has never needed a translator.